This issue brings you many interesting publications, starting with a new edition of the Policy in Focus (PIF) magazine, dedicated to the challenges and opportunities of the New Urban Agenda, adopted during the Habitat III conference held last October in Ecuador. In addition, we also bring to you studies on family faming worldwide, as well as on adult education in Brazil. As this is our last newsletter of 2016, we would like to briefly recap our work on knowledge production, one of the three pillars of the IPC-IG’s work, along with knowledge sharing and capacity strengthening. 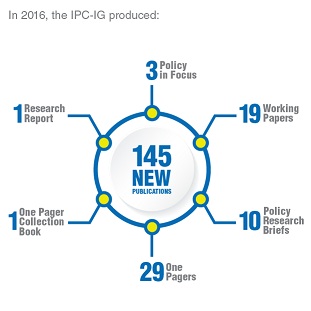 As you know, IPC-IG publications share newly produced and previously existing knowledge with a global audience, to improve international debate in the South-South arena. In 2016, the Centre produced 145 new publications, from topics ranging from food and nutrition security, to social protection and gender, to education and monitoring and evaluation, among others. In addition to this month's special edition, Policy in Focus had an issue dedicated to "Health policy in emerging economies: innovations and challenges", and the second edition of the year was on "Food and nutrition security: towards the full realisation of human rights". 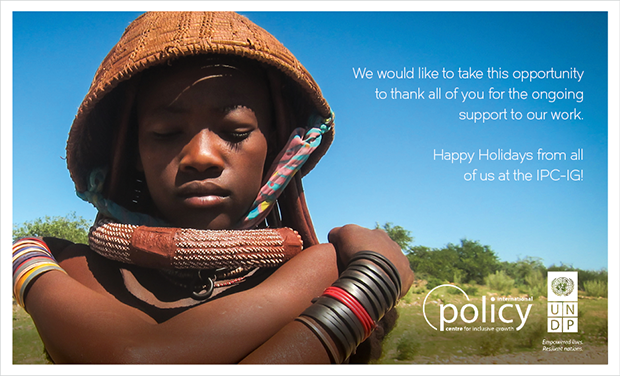 As we cap off the year, we would like to express our sincere gratitude for the ongoing support of partner institutions, international organisations, and our global network of thousands of collaborators, experts, policymakers and academics, as well as all of the Centre's friends, including you, dear reader. 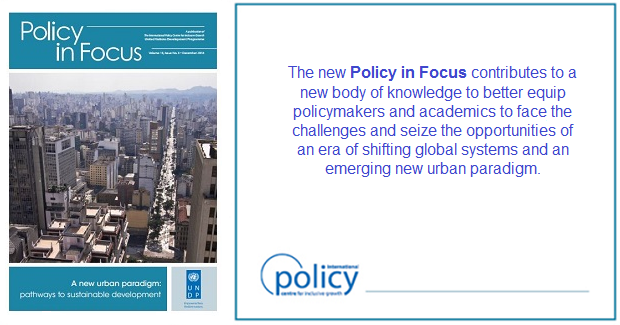 The IPC-IG is pleased to present you the new issue of its flagship publication, the Policy in Focus magazine, titled “A new urban paradigm: pathways to sustainable development”. It features 13 inspiring articles, delving into the challenges and opportunities presented by the adoption of the New Urban Agenda at the United Nations Conference on Housing and Sustainable Urban Development (Habitat III), held in October in Quito, Ecuador. By continuing the debate over the positive and transformative outcomes of well-planned urbanisation, this edition sheds light on new ways of thinking about our world, and contributes to a new body of knowledge to better equip policymakers and academics to face the challenges and seize the opportunities of an era of shifting global systems and an emerging new urban paradigm. This issue was produced in partnership with UN Habitat, and is available for download in PDF and smartphone/tablet-friendly formats. Here is a list of three must-read Working Papers that address family farming worldwide. First, the Working Paper titled “Family Farming in the Near East and North Africa”, authored by Ray Bush (University of Leeds), begins by exploring the meaning of the term ‘family farming’, and how appropriate it is in the NENA (Near East and North Africa) region, and continues by exploring more generally the role of farming and agriculture in the broader political economy of the region, among other issues. It also highlights a preoccupation among policymakers in the region, and also elsewhere, with a very restrictive definition of food security. In the Working Paper “Family Farms of North America”, John Ikerd (University of Missouri-Columbia) presents the historical role and evolution of family farming as well as challenges faced by family farmers in the region. Additionally, in the Working Paper titled “Family farming in Europe and Central Asia: history, characteristics, threats and potentials”, Jan Douwe van der Ploeg (Wageningen University and Research Centre, the Netherlands) addresses three basic questions: What does the family farm mean for the actors involved in it? Second, why, how and under what conditions is family farming important to society as a whole? And third, will family farming be relevant, attractive and important in the future of Europe and Central Asia? Moving on to the subject of education, in the Policy Research Brief “The Brazilian Adult Literacy Programme: a brief overview and possible areas of research”, Claudia Tufani (IPC IG) briefly describes the programme and provides a summary of its characteristics in Maceio, capital of the Brazilian state of Alagoas. The study aims at both making information about the programme more widely available and raising relevant questions about the programme’s effectiveness and economic and social impacts, with the goal of encouraging more research into it. This article is available in English and Portuguese. The One Pager "Social protection and the empowerment of rural women in Africa", by Raquel Tebaldi and Mariana Hoffmann (IPC-IG), and Maja Gavrilovic (Food and Agriculture Organization of the United Nations -FAO), summarises the main points of discussion of the eponymous webinar, held last June, which was the second of the webinar series titled ‘Gender-Sensitive Social Protection", a joint initiative by the IPC-IG and FAO. This webinar explored the potential of social protection to contribute to the empowerment of rural women, focusing on the African region. This study is available in English, French, and Portuguese, and was prepared as part of the project "Brazil & Africa: Fighting Poverty and Empowering Women via South-South Cooperation", financed by the United Kingdom Department for International Development (DFID). In the One Pager "Disability and social protection in Mongolia", Ludovico Carraro (Oxford Policy Management -OPM) provides a well-rounded overview of Mongolia’s social protection system for persons with disabilities (PWD), which has both social insurance and social assistance elements. The One Pager “Can Low-Income Countries Adopt Counter-Cyclical Policies?”, by Degol Hailu, (IPC-IG), and John Weeks (SOAS, University of London), is now available in Arabic. The study was previously published in English Chinese, French, Spanish, and Portuguese. The IPC-IG believes in the power of knowledge to change people's lives and the world. Indeed, part of the Centre’s mission is to produce evidence-based policy research, delivered through several different publication formats, ranging from the popular One Pagers to its flagship magazine, Policy in Focus, to the more technical Working Papers and Policy Research Briefs. IPC-IG publications are originally released in English but translated versions are also produced in Spanish, French, Portuguese, Chinese, Arabic, Italian, Turkish and Bahasa. The Centre received the visit of a high level delegation from the Government of Honduras on 12 December, to discuss working partnerships and foster capacity building, mainly on monitoring and evaluation (M&E) of social protection programmes such as the conditional cash transfer programme ‘Bono Vida Mejor’, among other initiatives. The head of the delegation, Minister Ricardo Cardona, Coordinator of the Sectorial Office for Development and Social Inclusion, presented a comprehensive overview of the country’s current social protection policies and programmes to the United Nations Coordinator in Brazil, UNDP Resident Representative and IPC-IG Director, Niky Fabiancic, as well as to the staff. Honduras has been devoting special attention to the Sustainable Development Goals (SDGs) in the process of designing and improving its social protection system. Accompanied by five Honduran government officials, Minister Cardona said that the visit to Brazil also seeks to learn from the Brazilian experiences of fighting poverty. IPC-IG Senior Research Coordinator, Diana Sawyer, presented the Centre’s work, its knowledge products and ongoing projects, while Senior Project Officer Mariana Balboni presented the vast outreach and knowledge-sharing tools and features of the socialprotection.org online platform, hosted by the Centre. The IPC-IG will participate in the PAA Africa Monitoring and Evaluation workshop in Rome, which is jointly organized by FAO and the World Food Programme (WFP), from 19 to 21 December. IPC-IG Research Associates Mario Gyori and Ana Carla Miranda will present the results of the PAA Africa’s monitoring, carried out by the Centre. They will also report on the cooperation between IPC-IG’s researchers and the Senegalese research team that worked on PAA’s evaluation in Senegal. Finally, the IPC-IG will also support the discussions around the future of the PAA Africa programme, given that its second phase is coming to a close in 2017. IPC-IG Research Associate Mario Gyori participated in conference "New social contract for MENA (Middle East and North Africa) countries: Experiences from Development and Social Policies”, held in Bonn, Germany, on 5 and 6 December. Mr. Gyori presented an IPC-IG' study on the introduction of a child allowance programme in Tunisia, where almost one quarter of all children (24.8 per cent) are poor. The main contribution of the study consists of estimations of the overall costs of such a programme and micro-simulations of the expected poverty impacts of both universal and targeted child allowance schemes in Tunisia. 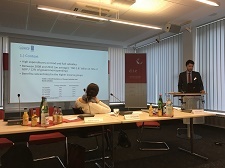 The event was organised by the German Development Institute (Deutsches Institut für Entwicklungspolitik -DIE) in co-operation with the Institute for Policy Research (IPR) of the University of Bath. The socialprotection.org team has just launched the 2017 Ambassador Programme! It is an online volunteer programme, operated via the United Nations Volunteers Programme (UNV) website. Selected ambassadors will participate providing content, knowledge exchange, networking and promotion for the socialprotection.org platform. Ambassadors will also have their profile featured on the platform. Become one of the Ambassadors or share this initiative with someone you think would like to! Learn more on how to apply here. 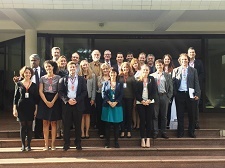 IPC-IG Senior Project Officer Livia Nogueira participated in a day-long ‘Partner’s Meeting Programme’, organised by the United Kingdom Department for International Development (DFID) Brazil on 8 December, at the British Embassy in Brasilia, Brazil. The aim of this working meeting with all DFID's partner institutions in Brazil was to evaluate the existing projects and plan future initiatives with the support of British cooperation in the country over the coming years. The Centre is responsible for the implementation of the Outcomes 1 and 2 of the project "Brazil & Africa: fighting poverty and empowering women via South-South Cooperation”, financed by DFID. Recently, the IPC-IG published its Progress Report on the implementation of Outcome 1, which comprised producing knowledge related to social protection and gender issues, aimed at Brazilian and African policymakers and practitioners, and promoting the sharing of knowledge among them. Read the report here. IPC-IG Senior Research Coordinator, Diana Sawyer, and Research Assistant, Anna Carolina Silva, together with UNDP Brazil's Programme Officer, Maria Teresa Amaral, met with officials from Rio de Janeiro's Municipal Secretariat of Sports and Leisure, in the City of Rio de Janeiro, on 1 December, to present the final study "Children at Olympic Villages”. The study was based on interviews and database analysis conducted in four community sport centres in Rio de Janeiro, and was developed in partnership with Nike, from June to November 2016. IPC-IG Research Coordinator Fabio Veras attended a two-day mission to Maputo, capital of Mozambique, on 1 and 2 December, to discuss with representatives from the Mozambican Ministry of Gender, Children and Social Action (MGCAS) and the National Institute for Social Action (INAS) the methodology and the topics to be covered by a one-week course that the Centre will deliver on Monitoring and Evaluation for Social Protection Systems The course aims at strengthening the knowledge of government officials on monitoring and evaluation, to support the implementation of Mozambique’s National Basic Social Security Strategy (2016-2024). It will be delivered in Maputo from 27 February to 3 March 2017, and it is part of the activities supported by the EU Social Protection System Programme (EU-SPS). IPC-IG Research Associate Pedro Arruda travelled to Maputo, Mozambique, from 21 to 25 November, to conduct interviews as inputs for his ongoing study on HIV-inclusive aspects of African social protection systems. This study intends to document and assess which cash transfer-related policy designs in Malawi, Mozambique Zambia, and Zimbabwe are HIV inclusive, documenting overall features linking social protection to efforts towards the prevention, treatment, care and mitigation of HIV. Mr. Arruda attended meetings with government representatives and UN stakeholders. The IPC-IG is accepting applications from outstanding students for its 2016 Internship and Fellowship Programme. We are looking for graduate-level students who are passionate about international development and who believe that inclusive growth, the dissemination of knowledge and social development have the power to transform societies. Requirements and information on how to apply are available here. If you know someone who would be interested in joining these programmes, help us spread the word. We would like to hear your opinion about the Inclusive Growth Bulletin. Please send us your comments and suggestions about the newsletter as well as topics you would like to read here at: ipc@ipc-undp.org.